MAN, it’s bothering me now in retrospect that the piece of art looks like it’s sitting right on top of that table lamp. Oh, well. Live and learn! And since I just pointed out a major flaw in my work that you might not have noticed had I just kept my mouth shut, let me let you in on another #fail of mine—I didn’t end up keeping today’s Thrift Store Score (or should I say, Thrift Store Splurge). While I pride myself on hunting down fairly good deals for the most part, I do occasionally shop badly. In fact, I’ll be even more honest with you and admit that today’s “thrifty” purchase, while cool as can be, was probably what prompted the personal heart to heart I had with myself at the beginning of the year. Click back to my January 1 post here to learn all about how I plan to shop less and more intentionally if you missed it, but that’s enough run around for the day. Let me get to the true story behind this cool retro table. John and I spotted it while taking our latest tour of a semi-local secondhand shop, Circa. It was tucked away in a back room, but as soon as I saw it out of the corner of my eye, I was hooked. I loved the edgy hourglass silhouette, and I also really loved the creamy color, which checked all the boxes of our neutral color palette at home. Then, upon closer inspection, I made an even cooler discovery—the table plugs in and the surface lights up (scroll down a bit to see a GIF that demos the light in action)! Picture me flicking that switch in store, my eyes growing to the size of teacup saucers, and my jaw falling wide open. I looked over at John to see if he was thinking the same thing, and I saw that a big smile had materialized on his face, too (which is basically John’s equivalent of my exaggerated reaction). I was scared to look at the tag, and more than a little disappointed to find out that it was listed for $150. Frankly, it was far too much to pay for the table, even taking into account the fact that it was such a unique piece. After mulling it over in the aisles of the store for a few minutes, I ultimately decided to let my impulsive side win, and I carted the side table up to the cash register. Against John’s better judgement, I should add. I think two things pushed me over the edge toward the purchase. First, the fact that the table was a huge conversation piece, and second, that it was also functional since it acted as both a lamp and a surface to place things on. The sad news is that, after getting the table home, I never could find the right spot for it. It looked silly (to my eye) without a table lamp on it, so that kind of busted the whole functionality equation, and we already had a collection of beautiful side tables to choose from. Do I regret buying it? Yeah, I honestly kind of do, although I’m so glad that I was able to share the find with you guys here on the blog. It got its five minutes of fame, after all, and I’m glad to tell you that it has since been donated to Habitat for Humanity to hopefully benefit another family in the end. I considered covering up the fact that this Thrift Store Score ended up being a splurgy fail, but I wanted to be extra transparent about the whole situation because I really do think that the purchase helped push me in my new direction of buying less often, but also purchasing with more purpose. Now, not only do I try to stick within a harder budget, but I also try not to bring anything home unless I can visualize an exact spot for it. Okay, guys. I’m going to let my craziness show here in a second, but I figured it was only fair that I demonstrate just how OCD I am about home decor—and, really, about everything in life. Late last year, I bought this pair of vintage wooden candleholders from one of our favorite antique stores here in town. They weren’t exactly the cheapest secondhand purchase I’ve ever made (I think the set cost $25), but I was kind of desperate to have them for a shoot, so I splurged. I also really loved the handmade, curvy shape—you know I can never resist something one-of-a-kind. After the shoot though, I tucked the candleholders away for a good long while because, for some reason, I had the hardest time finding the right spot for them in our home. No matter where I put them, they just felt a little off and too matchy-matchy. I tend to prefer things that look just a tad unbalanced and love styling in odd numbers to get that layered look, so these two identical wooden candleholders posed more of a problem than I had anticipated. Three months later, though, I couldn’t get the candleholders out of my head. I hated that I had spent so much money on them just to have them collecting dust in storage, so I decided to pull them out of the closet and challenged myself to set them up somewhere in the house. I tried them on the bookshelf in our master bedroom, and really liked the way the dark stained wood texture popped off the wall color, but they still weren’t quite right. Then, I had my lightbulb moment. In order to make the candleholders feel a little more layered and asymmetrical, all I needed to do was fill them with candlesticks that were slightly different heights! I told you this story was going to prove just how crazy OCD I am…But the good news is that I now love the candleholders and they finally feel juuuuuuuuust right in our home. I’m glad I didn’t give up on them. Do you guys have any weird, quirky things you do at home? Share your stories in the comments below! These days catharses comes in the form of finding that “needle in a haystack” type of thrift store find. 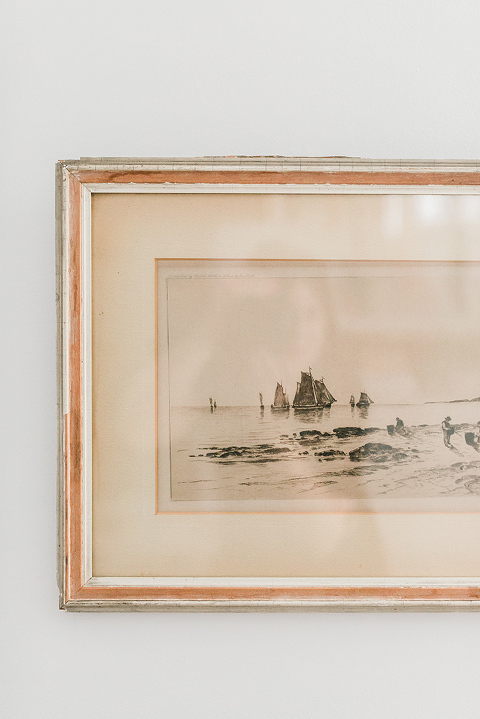 The rush from spotting the perfect piece is my kind of mental refresh, and since I’ve been cutting back on antique hunts as of late because I’m trying to keep more money in the bank and fewer things in our home, those moments are even more precious to me. That said, when I do stop in at the antique store, one of my favorite things to keep an eye out for is pottery. I know it’s incredibly trendy right now to fill surfaces with handmade pottery, but it’s one of those trends I adore so much, I don’t really mind buying into and “selling out” for it. There’s just something so interesting about owning a one-of-a-kind vessel, knowing that someone made it with their own two hands and that they had their own vision in mind for the finished product. Earlier this year, I happened upon a pretty sizable collection of handmade pottery in the basement of an antique store here in town. At the time I didn’t really have a spot for any one of the bowls, plates, and cups, but since upsizing the desk in my office, I had a bit more room for tabletop vessels. My first thought in trying to decide what to put there was the vintage pottery at our downtown antique shop. I’ve since been back to the display of secondhand clay containers a couple more times to grab additional pieces for gifts and other little spots throughout our house, and I noticed that the shop always seemed to have new pottery to fill what I took home. Come to find out from the store owner that the bowls are all part of a huge estate, and that the family of the woman who used to collect them so religiously replenishes the display at the antique shop every month or so. Knowing that someone so painstakingly gathered up all of these pieces of old pottery makes me appreciate the handful that I’ve chosen for myself even more. And the great thing about feeding this new secondhand addiction of mine is that pottery can serve all sorts of purposes around the house, so each one is a pretty practical purchase. Read on for a bunch of uses that I quickly came up with just now for pottery in a home. I mean, really, that list could go on and on, but you get the point—pottery is something you don’t need to feel guilty about picking up every chance you get. At least that’s what I keep telling myself. So, what are your favorite things to buy at antique stores? Are you just as into vintage pottery as I am? Whatever your goals, I wish you the best of luck with your secondhand treasure hunt this weekend! P.S. If you haven’t already done so, make sure to sign up for the Dream Green DIY Tribe newsletter here! Next week’s letter comes with a big (slightly bittersweet) business announcement that I don’t think I’ll be talking about here on the blog. If you want details, sign up to be part of our DIY Tribe here! Sorry for all of the quick posts around these parts lately, guys. Like the rest of the world, I’m attempting to slow down a little bit since this is summertime, after all, plus I’m keeping my head way down as I focus on bringing a few big ideas to life (including FINALLY launching a newsletter, which is why you’ve seen those invitations popping up on the site as of late—it launches next month, so sign up now to join our DIY tribe!). At any rate, I’m churning away on lots of exciting things behind the scenes, which means I’m keeping things light and airy here on the blog. Hopefully, you guys are enjoying some down time away from your computers and smart phone screens this season, too! But before I head off to throw myself into today’s entrepreneurial duties, I wanted to share one new Thrift Store Score story: my new-to-me boho stool. This little woven beauty came to me via a traveling flea market that I just happened to come across one day while out solo hunting for antiques. “Happened across,” as in, I literally was driving from one antique store downtown to another a little further out of town when I randomly spotted the flea market from the highway. It was a massive event with 4-5 building stuffed with vendors and hundreds of other individually run stands packed along the gravel lots in between. I’m usually not the type of person to just “pop into” a large-scale event without doing extensive research beforehand, and I never go to such things without either John or a buddy along for moral support, but that day I was on my own and apparently feeling extra spontaneous. I think I was also feeling a little bolder than normal having picked up a few good finds downtown (i.e. the hand-carved wooden bowl you see holding coasters above, and the cool architecture coffee table book pictured below). I couldn’t resist the urge to pull in and see what was up. I crunched my way over the gravel drive to get down to the convention area and was met by a parking attendant. It turned out that there was a $5 fee to get in. Thankfully, I happened to have some cash on hand so I didn’t have to turn right around without following through on my adventure. After forking over the cash, I decided not to beat around the bush and admitted to the woman that I had no idea what I was getting myself into. “So, this was a very spontaneous decision…” I said. “What do I do? !” The woman went a little wide-eyed before going into business mode. She pointed down toward a grassy field where I could park, and then explained that I would find flea-market-style vendors scattered across the central gravel lots and more high-end furniture, fixtures, and jewelry in the five buildings. I nodded meekly and moved the car into the grass as instructed. While I certainly expected to find a treasure trove of goodies (why else would I have stepped so far out of my comfort zone to get there?!) I ended up leaving with just two things. I wandered and wandered the entire antique show only to find that most of the items were older than the mid-century era I typically gravitate toward. In other words, everything was pretty “farmhouse” and rustic. It was a blast to walk through the event—it just ended up being more about the experience than the Thrift Store Scores, per se. So, what did I end up getting? A piece of $2 art that I’ll share about a little later on, and the boho stool that this post is dedicated to. It cost $20, which is a little high for what it is, but the intricately woven texture is just so beautiful up close. I must have walked by the stool on four or five different occasions, giving it major side eye each time, and ultimately I decided that it was worth my twenty bucks. Let this be a lesson to you that you never quite know what you’ll find while out antiquing (whether it’s just inspiration or a cool new-to-you possession), and to go ahead and step out of your comfort zone every now and then. Tell us about a recent Thrift Store Score of your own in the comments below. I recently realized that I haven’t shared a Thrift Store Score story with you guys in a long time, so I spent about 20 minutes earlier this month wandering through our home photographing the latest secondhand treasures that have made their way into our possession. First up? This beautiful oriental rug that I actually caught sight of in a local antique store ages ago. I loved it—like, reallyyyyyy loved it—but I could never find a price tag, so I left it behind thinking it’d be out of budget. Then, about three weeks ago, I decided to bite the bullet and just ask. Turns out that the rug, which is admittedly pretty beat up and worn in, was going for a cool $20, so I scooped it up—decade’s worth of dust and all. I think the woman at the register was so astounded that I would even want the rug in its current state that she was willing to let it go for a steal. I actually did call up a local rug cleaner to look into potentially giving it a professional clean, but I’m honestly not too anxious to get it done. We unrolled the new-to-us rug under the dining table in our newly-painted sunroom (full reveal coming soon! ), and I haven’t touched it since. I love the character of those worn corners, frayed edges, and faded colors. I still can’t believe that it’s mine and I’m only $20 poorer—I thought, for sure, that it’d be more than $200 since frayed antique area rugs are so “in vogue” these days. Just goes to show that you should always ask, even if you’re a little scared to know the final price tag. While I was out antiquing, I also picked up that pretty handmade hanging basket you see for $10 and the bamboo tray on the table for just $3 to hold things like potted plants and mid-read magazines. I’ve definitely slowed down my thrift store shopping as of late because of how much stuff we already have and how little of a budget we’re working with, but when I do head out, the activity is still just as inspiring as it ever was. Tell us about a few of your own Thrift Store Scores in the comments below! You know what’s sad? I’m so ram-rod focused on styling perfection, that I just got lost in a rabbit hole of hunting for the perfect “mid-century digital clock” to replace the cheap Target one you see pictured above. It’s embarrassing how desperate I get to replace things that are perfectly functional yet imperfectly designed. I just thought I’d let you know that I’m feeling a little obsessive and psychotic this morning, and anything but pulled together in case you thought that was the case. Anyway, I digress. The point of this post isn’t to fixate on silly styling obsessions. 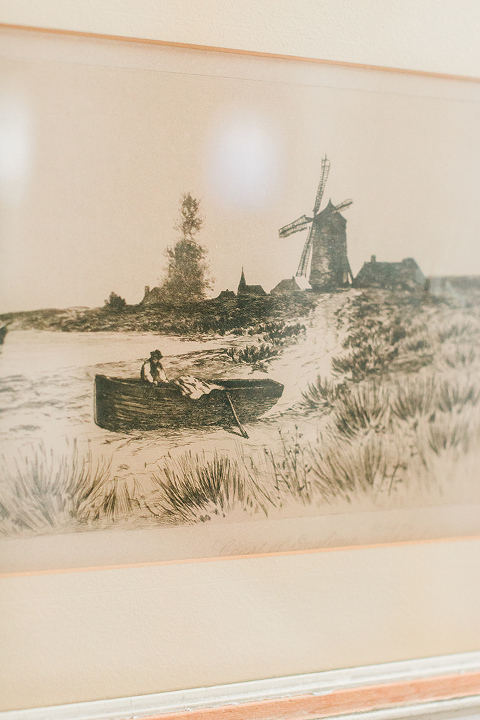 It’s about celebrating our new-to-us collection of vintage landscape paintings! As an editor at Glitter Guide one of my main roles is to coordinate and produce our weekly home tour content. I love, love, love this part of my job because I have the chance to connect with designers whom I admire from afar, and I get to learn all sorts of new tips and tricks throughout the process of interviewing them. Case in point, our upcoming home tour with MM Vintage shop owner, Molly Mathias. The moment I brought up the photos she submitted for her tour, I was smitten. 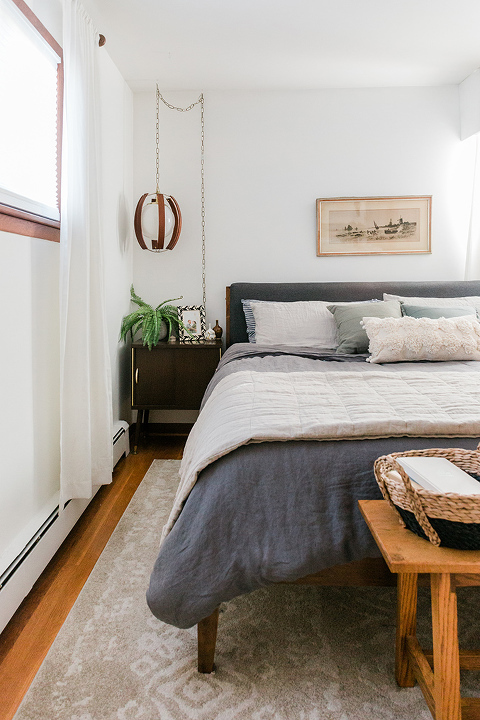 Her home is filled, top to bottom, with gorgeous mid-century finds (think: woven wall hangings, danish wood dressers, cool ceramics, paintings, etc.). I fell particularly hard for a set of vintage landscape watercolors that she had displayed over a credenza in her home, and I remember thinking, “I could totally do that!” Literally one week later, I had crossed the to-do off my list, and I thought I’d let you in on the tale. The two framed pieces you see off to the right-hand side of our newly-hung gallery wall came from my favorite antique mall in Williamsburg, Virginia. The second one in the upper left-hand corner came from another vintage shop in Richmond, which, unfortunately, I’ve forgotten the name of. All three feel cohesive, though, because of the warm earth tones, and the mountain-scape subject matter. Since we live in a particularly hilly region of Virginia, the set really speaks to my love for this area that we call home. In case you’re curious to know how much this collection cost, the pair from Williamsburg was about $150 total, whereas the little one from Richmond clocked in at around $40. Certainly not nothing, but the original, 1960’s dated paintings felt worth the investment to me. Purchasing art is such a subjective thing, so I can’t really tell you what a good deal is and what a bad deal will run you. But, here’s a tip, though! If you spot a piece of art that you love, try imagining in your mind how much you’d be willing to pay for it. Then check the price tag. If it’s not more than $10 over your estimate, I would say it’s worth seriously considering purchasing the piece of art. The moral of the story? Don’t waste those interior design inspiration images that are just sitting in your digital collection (think: Pinterest, screenshots on your phone, saved Instagram images). Instead, why not pause, take a closer look, and find something that you can do in your own home to recreate the vibe. 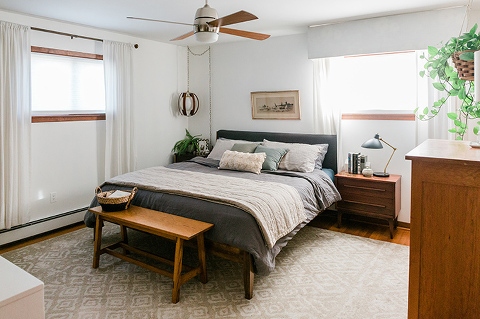 I love that Molly’s beautiful home (which goes live on Glitter Guide next week) could literally manifest itself in our own space, so consider this a challenge to follow suit with a dream room or home that inspires you! P.S. Have you voted for our space in this year’s Design Dash hosted by La-Z-Boy yet?! See the room I made over with my Glitter Guide teammate, Caitlin Kruse, here. Each vote enters you for a chance to win $15,000 to put towards a room of your OWN, so don’t wait!